Global Forest Watch, a new $25 million dollar, web-based tool — which was created through a partnership of the World Resources Institute (WRI), ESRI, United Nations Environment Program (UNEP), Google, and a slew of other environmental groups — aims to provide a “near-real time” view of deforestation (and reforestation) around the world. According to data from Google and the University of Maryland, the world has lost 2.3 million square kilometers of trees from 2000 to 2012 from logging, diseases, and storms. BBC News tells us this is the equivalent to 50 football fields of trees being lost “every minute of every day over the past 12 years.” But during the same time frame, about 800,000 square kilometers of new forest were also planted. Still, this means the world has lost forest cover equal to the size of Mongolia in little more than a decade. The world can’t keep going at this rate given only about 15 percent of the planet’s original forest cover now remains. 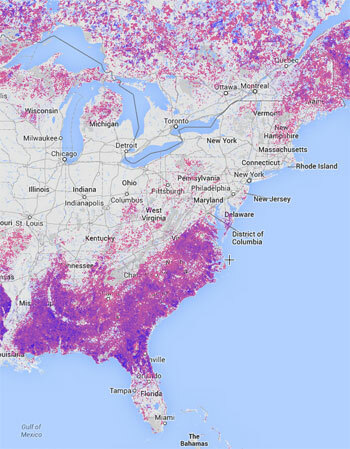 Since the late 1990s, WRI has led the development of the forest watch service, which “unites satellite technology, open data, and crowdsourcing to guarantee access to timely and reliable information about forests.” The program uses more than half a billion high-res images from NASA’s Landsat program, which are organized with new algorithms created by the University of Maryland, and then made available for easy online access thanks to the cloud computing power of Google’s Earth and Maps engines. BBC News writes that high-res images of global tree loss and gain are updated annually while data on tropical forests is updated monthly. The trick will be getting out some final kinks, writes The Christian Science Monitor. Critics of the program say it currently can’t distinguish between forests and industrial plantations, a major problem given rows of palm trees shouldn’t really be counted as a forest, given these mono-cultures provide very few ecosystem services. An amazing resource, reconnect with forests at a global scale.